Raw meaty bones (RMB) are a great source of nutrients for your dog and a wonderful way to keep his teeth clean and shinny. RMBs may be used as a source of calcium in a raw-food diet or for recreational chewing. COOKED BONES SHOULD NEVER BE FED TO YOUR DOG. Examples of types of RMBs that can be fed include turkey necks, beef ribs, chicken backs, pork tails, or lamb necks. 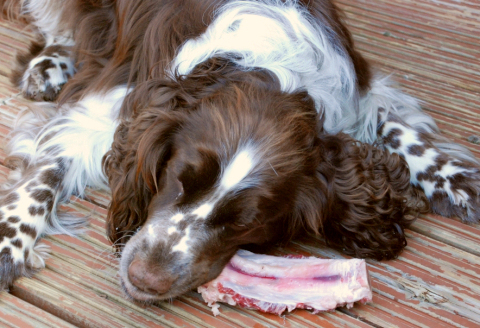 RMBs can be messy, so crate your dog with his bone or feed the bones outside or inside on a towel or blanket. If you have more than one dog in your household, be sure to provide privacy to the dog eating his RMB so as to avoid resource guarding.